Home » Would You Rent Tires? The cost for new tires just keeps going up. Part of this is simply due to inflation. However recently, the cause was a tariff the United States placed on rubber imports from China. This tariff was enacted in 2009 and after prices for rubber and tires jumping 40% over the past three years, the tariff was rescinded. But the damage is still being felt be consumers. The average cost of a new tire is over $100. If you need to replace all four tires, you are looking at bill of close to $600 when fees, labor and taxes are added in. If I were to talk about the special run flat tires, you would probably faint. I’ll take the chance and tell you it’s over $1,000. 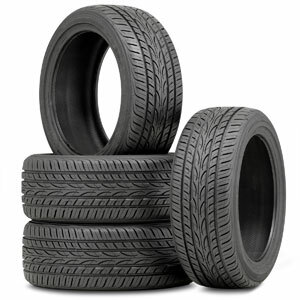 Because of the sky high prices, the demand for renting tires has increased. There are small wheel stores all over the country that rent out high price rims for cars. With the increase in tire cost, they are seeing a flood of customers interested to rent tires. You can walk out the door with four new tires for less than $100, which is a great deal until you factor in the total rental costs. Here is how tire rental works: you go to the store and pick out your tires. The store will quote you a monthly price and a term. For example, let’s say you rented a set of four tires for $50 per month for 18 months. At first, the deal is great. You get new tires for about 1/8th of the cost. But quick math shows that over the life of the 18 month loan, you are paying $900 for renting the tires. You are spending close to $300 more on the tires by renting them versus simply buying them new. But the problem is that consumers don’t have the cash for the new tires. People that are in this situation need to start budgeting so that they can get control of their finances. Doing so will help them avoid getting stuck between a rock and a hard place. I know when I first started driving, I was taught to save something each month for maintaining your car. At the time I didn’t understand why this was done. Now that I am older I do. A car is a wear and tear item. As you use it, it breaks down. Ideally it doesn’t break down that frequently, but odds are something will break. Having that money saved eliminates the need to tap your credit card or worse, renting tires. Your monthly savings doesn’t need to be astronomical either. Try $10 per month and add to it as time goes on. It doesn’t sound like much, but over time it adds up, assuming you only use it for car maintenance. Learning to budget your money is a basic financial principle that needs to be learned so that you can reach your financial dreams. Along with budgeting will come a basic understanding of how finance works, which will help you to realize that a deal that appears to be too good to be true, like renting tires, is actually a horrible deal. Readers, would you ever rent tires? So, are you actually renting them? Or buying on time? Do you give them back at the end of the term? Can you turn them in early and not pay for months not used? We don’t own a car, but we have three motorcycles. If ever that we need to change our old tires we bought a new tire. We had also tried to recapped our old tires, but we observed that the recapped tires and brand new tires have almost the same price, but the recapped tires will only last for a few months unlike to the brand new tires that you will lasts longer.